It's always amazing how persistant DMA Design has been in my life. Immediately after the museum exhibition opened, I was interviewed by James Christie from BBC Radio Scotland as one of the founders of DMA Design. You can read my thoughts on being a 'founder' elsewhere on the blog, though it's certainly true that, in the fashion of Londo from Babylon 5, "I was there at the beginning..."
It was to be a half hour documentary, and it has just aired this morning. I'm always nervous when something is broadcast with a contribution from me in it. And, yes, it's still amazing when I think about it, that I can casually write a sentence like the previous one. This one, however, was especially nerve-wracking for reasons that I can't quite put my finger on. Would I sound OK? Did I make sense? Would my contribution even get used? Fortunately the answer was yes, and now I'm left with a curious mix of nostalgia and excitement, even as I realise that only a small fraction of my interview was used and only those parts which fitted the 'narrative' that documentaries use. I'm sure it was the same for both Mike and Russel who were also part of it. But it means that there's a huge amount of story that hasn't been told, that doesn't exist on Wikipedia or anywhere else aside from in our heads and the odd fragment on a website here and there. I close my eyes and I can see the old, old, office. I recorded some important events in a journal I kept at DMA in 1996, but I so wish that I'd done the same for 1995, 1994, 1993... But of course at the time none of us had any idea that DMA would be important and very little was jotted down and nothing at all formally recorded. It makes the piecing together of DMA's history an exercise in deductive work where I still have scraps of paper, or tickets to hint at the exact date something occurred. And that's what it was like in the days before blogs, twitter and 24/7 recording, when it was still possible for a mythology to arise. Being a mythology-minded person, I really love the last line of your post, Steve. AND read a little about the very early days too! That is awesome. I stumbled across this blog via a slashdot post. How I wish someone who has been heavily involved in the game industry would write a book about game programming and design. There are a lot of books published on this area but like many books published in the computer industry they have been thrown together by two-bit hacks with no actual industry experience. I have no ambition to work in the game industry myself (I used to work as a database programmer before I got burnt out), but I'd like to be able to program some simple games (like from the commodore 64 or spectrum era) myself. The few books I've read have been lacking in insight. I've got to admit that my industry experience isn't exactly current. 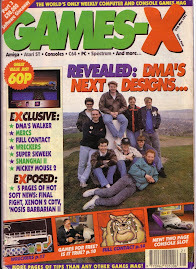 I write about DMA as a nostalgia thing. I did actually try to get a publisher interested in a book about game design - and this was in 1998/99 or so - but no-one was interested. I'll bet it's different nowadays.